I am trying to develop some native Android apps using Android Studio (latest) on OS X Yosemite. Currently Android Studio is simply unusable: it is too slow. I am not referring to the Android emulator, which was doubling the development time, but to the source code editor itself. The main problem is that very often but not always (I would say almost always) it is not able to keep the pace of my editing: when I edit text, characters appear on the screen between one and two seconds later. If I delete characters, I never know which one I reached without waiting for a couple of seconds. If I right-click I wait for the equivalent of geological ages before something is displayed. It is almost impossible to use the graphical layout editor because it is sloooow. I have also other problems, related to incredible bugs. But I want to focus on this basic functionality. Actually I have only increased the allocated memory for the first two of them. Is there anyone developing for Android on a Mac who was able to increase this basic performance of Android Studio? Is there any hidden trick, combination of JVM and options able to make this app usable? I am working on a MBP 2.3GHz i7 with 16GB of RAM: is it enough? I did the following to resolve the Android Studio slowness. Restart Android Studio and that's it. Activate Compiler features: Settings -> Compiler, then activate "Compiler independent...", "Use in-process build" and "Configuration on demand". With these two tricks you'll feel the difference. Let me know. Yes, that is enough computer. I use Android Studio on both my Mid 2011 iMac and my MBP 2.5GHz i7. Android Studio and the emulator are pretty slow to load on the iMac, but I do not have the issues while typing that you describe on either machine. 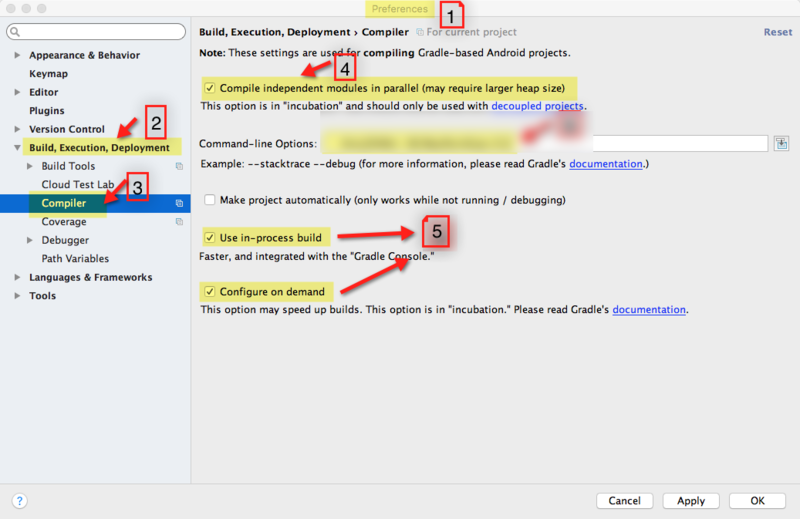 What version of Android Studio are you using?